Laser marking in the medical device industry has become critically important in the twenty-first century. With manufacturers worldwide producing a wide range of medical devices, it is necessary to clearly identify the raw materials, instructions for use, risks and troubleshooting options. In the event of an implanted device such as a pacemaker or cardioverter defibrillator malfunctioning, medical professionals must be able to access adequate information about the medical device manufacturer and the product instantaneously. Traditional laser marking of medical devices mainly took the form of imprinting information that was easy to read on implements such as surgical and dental tools. The laser markings needed to be able to withstand years of regular sterilization and use, and had to be executed without damage to the chemical passivation or anti-corrosion coating. The requirements of modern medicine, however, have expanded the use of laser marking to include items such as artificial joints, metal bone replacement plates and the screws that secure them. This is where the value of non-contact laser marking on metal medical devices has proved its worth. The high-precision capability of the non-contact laser marking process ensures that the information imprinted on the medical devices is durable and hygienic enough for use in invasive items such as hypodermic needles, catheters or insulin pumps. Annealing different colors on metal instruments for depth measurements during surgery is an advanced application requiring real precision, as is the marking of metal tubing. The abrasion-resistant, permanent nature of high-speed, high-precision laser marking makes it possible to use on high-alloy stainless steel, titanium, silver, ceramic or tungsten carbide. It can also be applied to materials previously not markable, including polyamides and silicones used for devices such as hearing aids. The unique global identification marking system, known as UID (Unique Identifier), is used for tracking and identification purposes in industries such as aerospace, defense, electronics and medical technology. Guided by software that can produce 2D matrix codes and consecutive numbering as well as unique identifiers such as barcodes, direct part marking enables traceability of each individual component of a device. Custom-made devices can now be identified as such, and the manufacturer’s information indelibly recorded for safety and recourse purposes in the event of a malfunction. Laser marking systems perform using a variety of wavelengths, strengths and adjustable pulses of different widths, which operate at a rate ranging from a single pulse to a continuous wave. The laser marking system is flexible and can perform both deeply etched laser markings as well as placement of contrasting laser marks, on all types of materials. No chemicals are needed for processing of the laser marking, which helps to prevent damage to the base material. The precision laser marking software enables the laser marking system to select the correct location for the laser marking, as well as to produce unique markings based on codes input using the application. As laser marks are generated, they are updated in a database in both data matrix code and readable text. The Future of Laser Marking is Now! 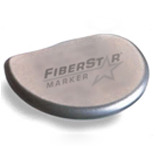 The portability of laser marking systems makes it possible to create custom-made laser marks. Microscopic laser marking with character heights of 10 µm can be made, leading to the option of nano-technology uses as it becomes mainstream. Whatever needs the medical device industry identifies it’s likely that laser marking will be used, due to mark permanency, reliability, and precision. Laser marking systems are being used to add logos and design elements as medical equipment suppliers become more conversant with the technology, and equipment manufacturers and material suppliers are increasing their use of laser-markable substrates. Improvements in the laser marking process will provide ongoing solutions as the medical device industry continues to develop new products.